What on earth are you rabbiting on about now? Just the usual kind of rubbish. 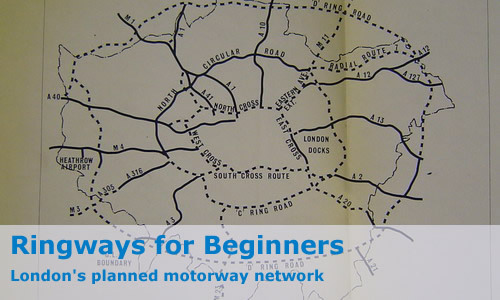 Unlike the inner Ringways, a large amount of Ringway 3 was built and is in use today - something around half of the length is open today almost exactly as planned. Of course, it just wouldn't be the same if it was at all obvious, would it? I suppose not. So, just where is it? Simple - it's the modern M25 from the A1(M) at South Mimms all the way around to the A20 in Kent. Pretty much all that happened was that the orders for signposts saying "M16" were replaced with orders for "M25" ones. So what was the rest of the route like? As mentioned, it would have left the present M25 at the A20, and then headed round in a nice curve to New Addington. This bit's really easy, there's a number of contemporary commercial maps that show the route to that point. From there to the A3, no final decision regarding routing was made although of the final shortlist of two, the less destructive version south of Croydon was more likely than the one that pretty much ran through the town centre. From there the route is better known, meeting the M3 around junction 1, then passing just east of Heathrow Airport meeting the M4 at junction 3 before following the A312 northwards to Yeading Brook. At this point there was an argument between the GLC and the Ministry as to which way to take the road. The Ministry wanted to take the easier route through open land, whilst the GLC, perhaps surprisingly as they were the ones that needed to deal with voters, wanted to plough straight through the urban areas near Pinner. As it was the Ministry's road, it seems that perhaps not too surprisingly, they won the argument. From Pinner Green the route then headed round in a nice curve before meeting the M1 between junctions 4 and 5, and then finally meeting up with that nice big gap in the M25's carriageways just to the east of the A1. Just to keep the whole thing exciting, this one's got a weekend name too, "D Ring". You mentioned the number M16. Was that to be the number of Ringway 3? The simple answer is that we don't know. We do know for absolutely certain that M16 was used between the Dartford Crossing and the A1, and there's a file in the National Archives called "Highway Projects - Planning: Ringway 3 (M16) Yeading to South Mimms", though the M16 number doesn't actually appear in it at all. But.... evidence that has recently come to light shows that M16 was used to refer to the section between A4020 and the M1, and logically then onwards to the A1.